Cn. Domitius L.f. Ahenobarbus was a general and politician in the 1st century BC. He struck coins in 42 BC, both alone and with Marcus Antonius. In 42 BC he commanded a Republican fleet of fifty ships in the Ionian sea, and gained considerable success against the Second Triumvirate, completely defeating Gnaeus Domitius Calvinus on the day of the first battle of Philippi, as the latter attempted to sail out of Brundisium. 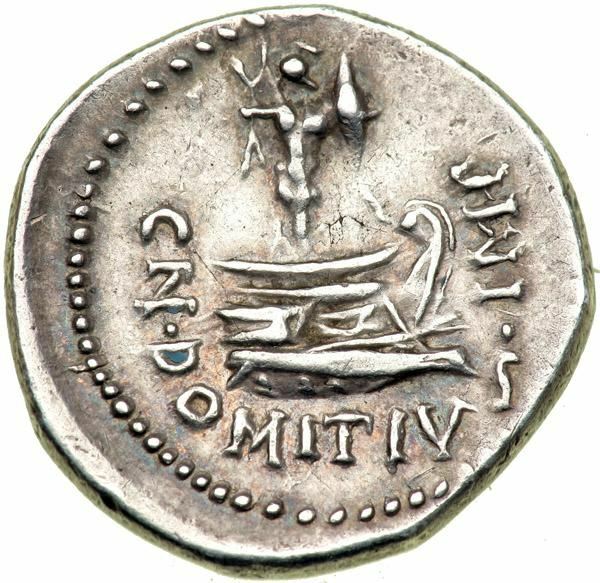 He was saluted Imperator in consequence, and a record of this victory is preserved in the annexed coin, which represents a trophy placed upon the prow of a vessel. The head on the other side of the coin has a beard, in reference to the reputed origin of the Ahenobarbus family. He became consul, according to agreement, in 32 BC, in which year the open rupture took place between Antony and Augustus. With Gaius Sosius, Ahenobarbus fled from Rome to Antony at Ephesus, where he found Cleopatra with him, and endeavored, in vain, to obtain her removal from the army. Many of the soldiers, disgusted with the conduct of Antony, offered the command to him; but he preferred to desert the party altogether, and defected to Augustus shortly before the battle of Actium in 31 BC. He died of a fever shortly after.